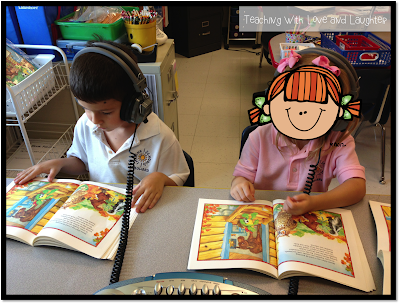 Students listen to a book on tape or CD and then talk about it with each other. 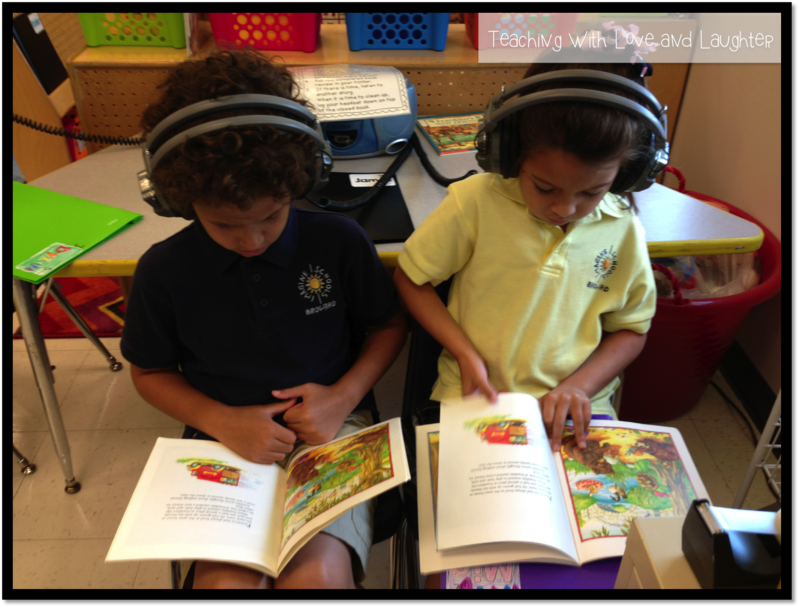 Students continue to work on building their stamina. 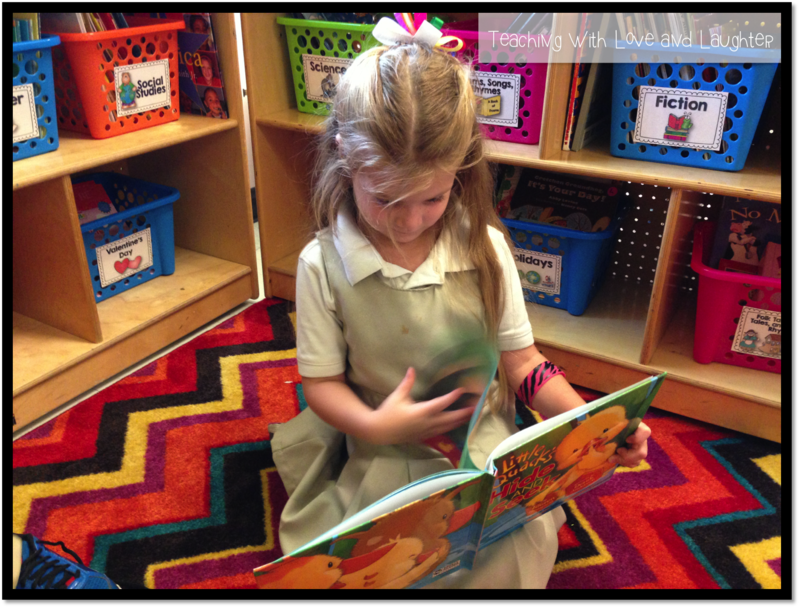 They are learning to choose good fit books and how to use our classroom library. 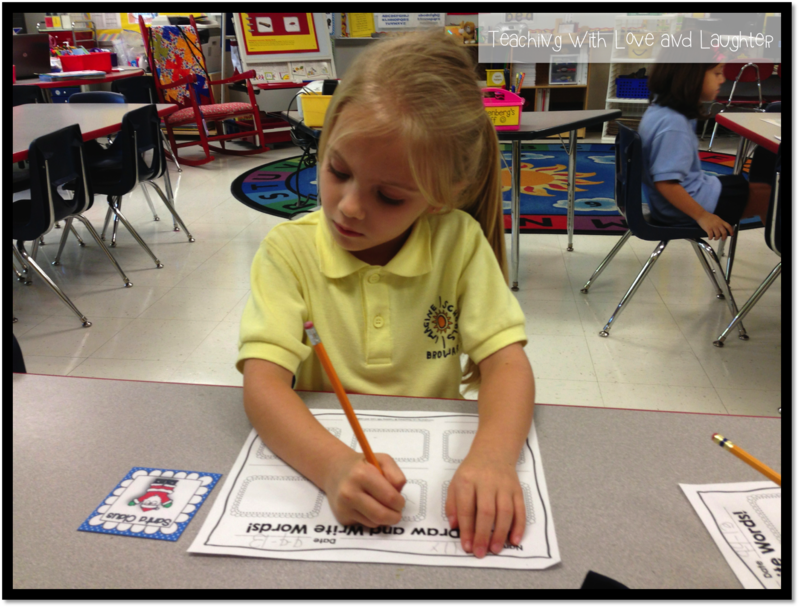 This student is working on an activity from A Differentiated Kindergarten's Back to School Word Work Galore pack. Students choose a letter from the basket and write it in the star, then they need to write the next 3 letters that follow it. They loved it! Here is one of my Journeys Sentence Puzzles. We practiced these last week, so the children were able to complete it independently. I am a HUGE fan of sentence puzzles, which is why I have created these for just about every season and every reason! For the next several weeks, kindergarten will be learning about nouns. 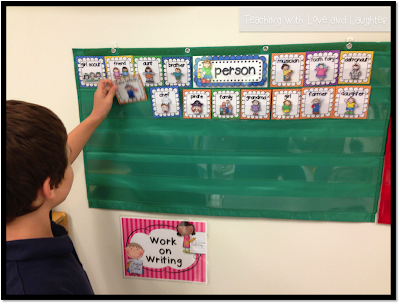 This week, we are focusing on nouns for people. This cutie is using one of the cards from my Fun With Parts of Speech pack, and a recording sheet from my Writing Right Through...pack. 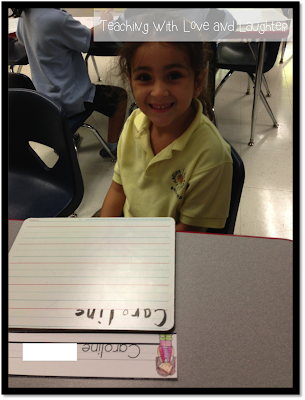 She's writing different nouns that name people and illustrating each one. Here's another picture of the same station. At this station, children are practicing writing their names on white boards and magna doodles, referring to their name cards, if necessary. The only two stations missing are Meet With the Teacher and Writer's Notebook. I am not ready to meet with small groups yet, so I am circulating the room and assisting where necessary. 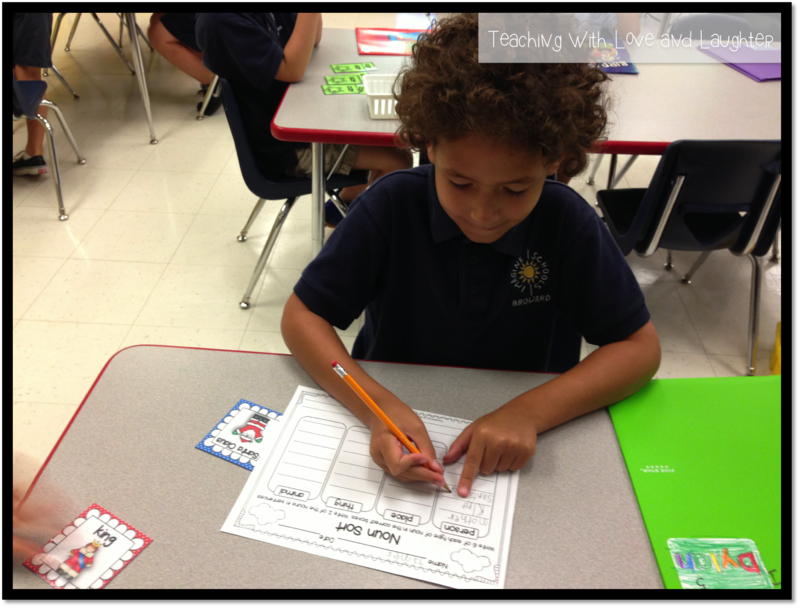 Next week, I'll introduce our Writer's Notebook as a station. Students can write whatever they want in their notebook. Students listen to a story and then write a book review. This book review comes from my Writing Activities for Young Learners Part 2 pack. But I have different ones in my Writing Right Through...packs, that are specific to seasons, holidays, and themes. This week, first graders are learning about nouns. Students are sorting nouns from my Fun With Parts of Speech pack and then filling out a recording sheet. I love how he is practicing his finger spaces! 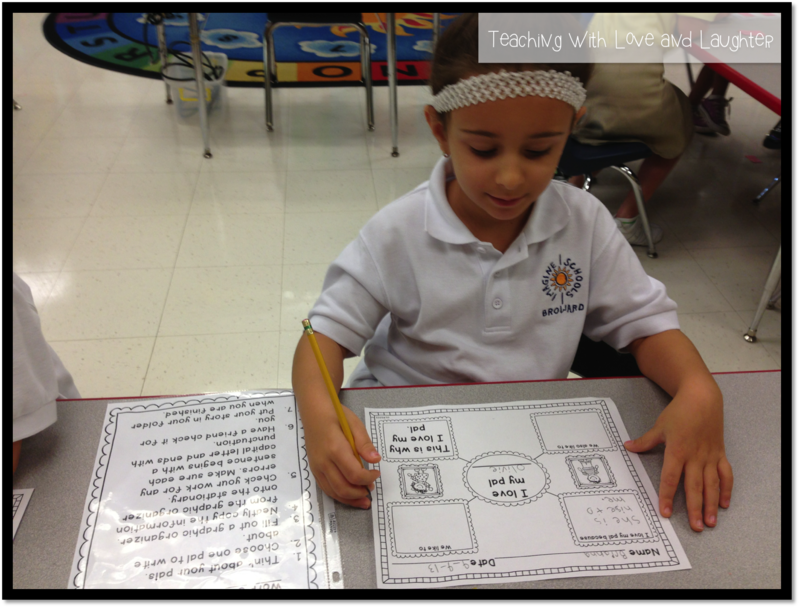 This station is all about sight words. 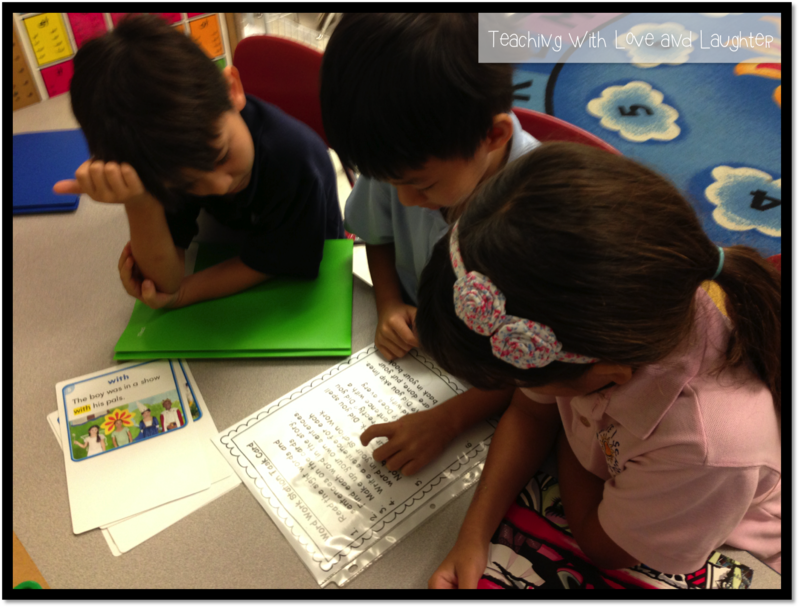 Students are reading the task card, which I have at all stations, and figuring out what to do. First, they read the sight word cards and sentences to each other. 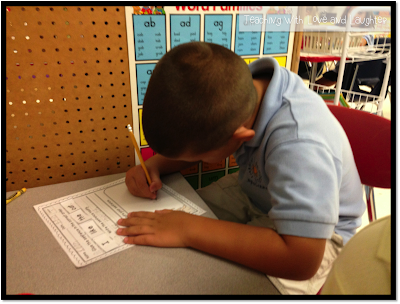 Then, they think of their own sentences and write them in their Station Notebook. When they are done, they can complete Read it, Make it, Write it. 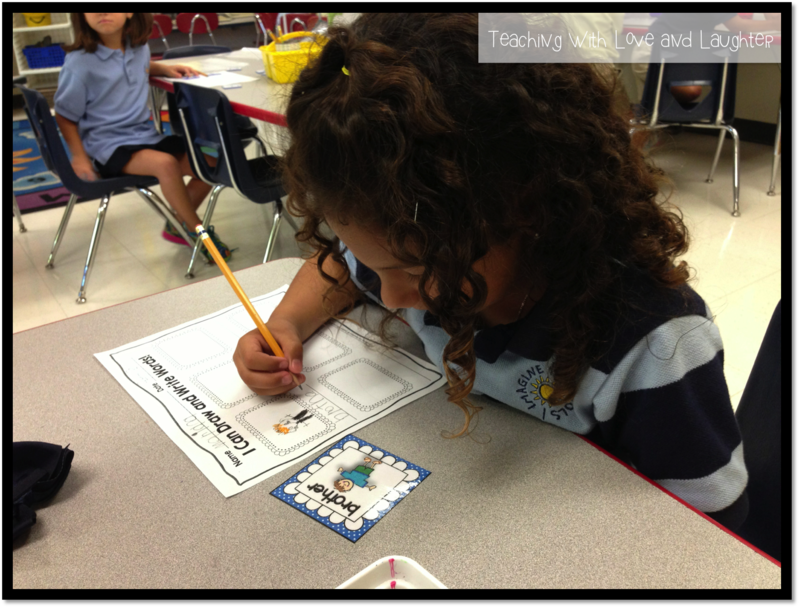 In this activity, they read each sight word, make them with letter beads, and practice writing them a few times. 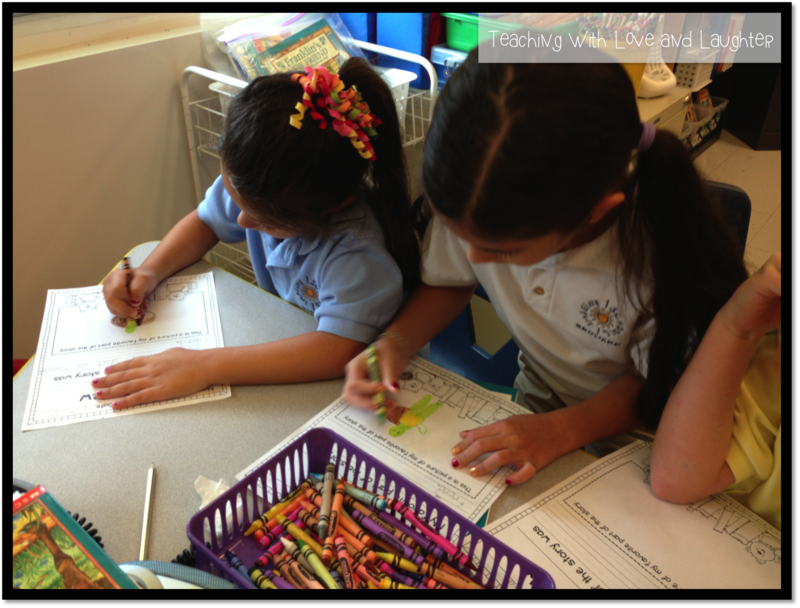 Here, students are playing Roll, Say, Keep. They LOVE this game. 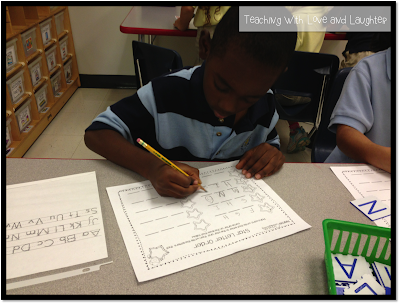 They are practicing words with short a. That is our spelling skill for this week. Each game contains 40 words that follow specific spelling patterns. Plus some message cards that make the game a ton of fun! 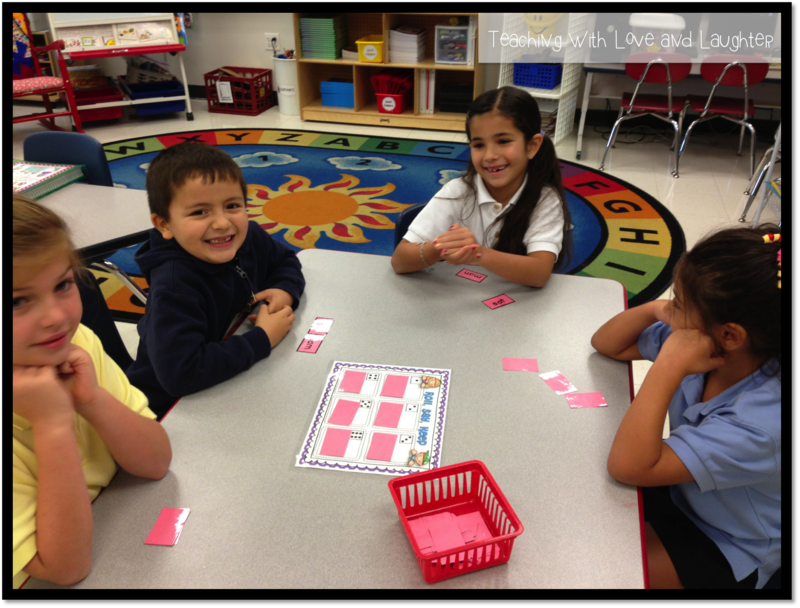 Students can also choose to play Go Fish this week! This week's reading skill is main idea. At this station, I combined main idea with some writing. Since we are talking about pals, the center of the web is the main idea, "I love my pal..." and in each box, the children write a detail about why they love their pal. When they are done, they will copy their web onto nice stationary, and have a story to give their pal. The only stations missing are Read to Self (I didn't take any pictures), Meet With the Teacher (no small groups today), and Writer's Notebook. This station was closed today. Once I have my routines set in stone, I'll share my station board and how my students rotate. I got a lot of ideas from Marsha! She has wonderful ideas for rotating and I stole was inspired by them. LOL! Looks great Lori! 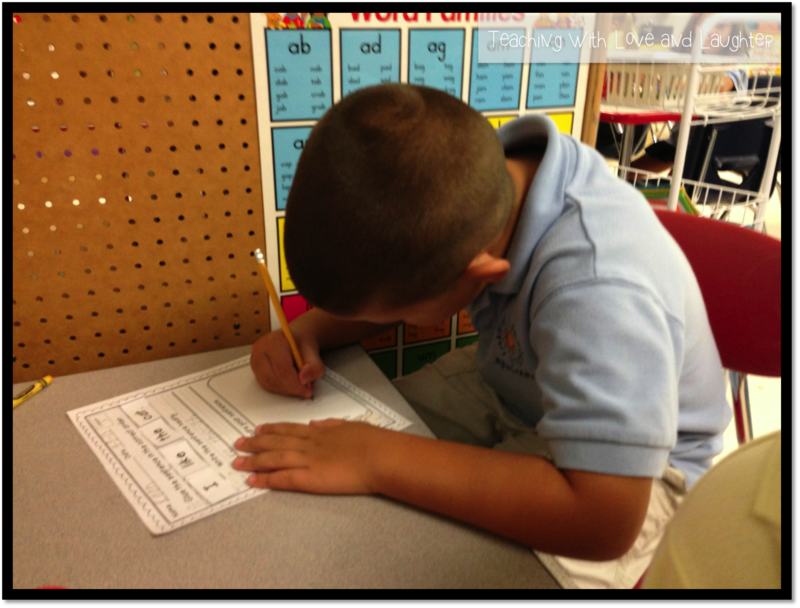 I love taking pictures of my kids during centers! They are productive, engaged, and having fun! Have a great week! Love all the pictures!! What a hard working group! Is the "I love my pal"web in one of your units? I probably own it already,but can't remember which one it would be in. I just tried to email you but it came back as undeliverable. Can you email me? Thanks! Thank you for sharing your ideas. As a future teacher, I am excited to hear how other teachers would incorporate ideas into their classrooms. I love your ideas! The grammar station is a fun one that I think I'll add to my room! Thanks! 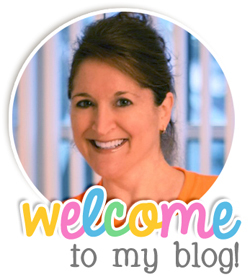 Found you on the TpT forum, and I'm SO glad I did!